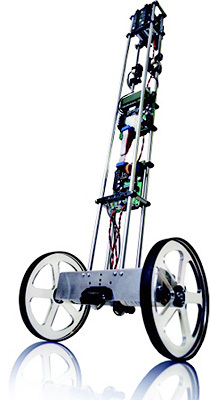 BalBot – Build Your Own Segway-esque Robot | OhGizmo! Ok, so the downside of this kit is that even though this robot can balance like a Segway, it can’t actually be ridden like one. In fact I think even a G.I. Joe figure would be hard pressed to find a place to sit without toppling this thing over. Other than that it’s perfect if you’re the type who’s into DIY projects, and especially DIY projects that actually end up working and not just falling over and catching fire. The kit includes all the parts needed to build this fully autonomous robot that can not only balance but also navigate around a room and avoid obstacles. And the best part I think is that there’s no soldering required to build it. However you will need a working knowledge of programming in C if you want to customize it at all, but on the plus side the kit also includes a development environment with a compiler, IDE and device programmer which supposedly makes things a little easier. I can tell you for sure though that doesn’t help me at all. The BalBot robot kit is available from Edmund Scientific’s for $549 but at the time of writing they seem to be sold-out.